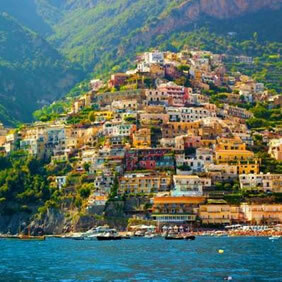 Naples, Capri, Sorrento, Amalfi & more! 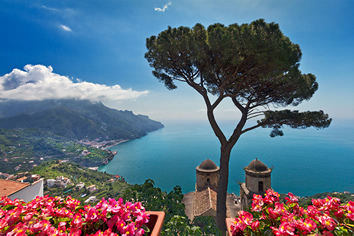 An exclusive and unforgettable Gay Naples, Capri and the Amalfi Coast Tour! 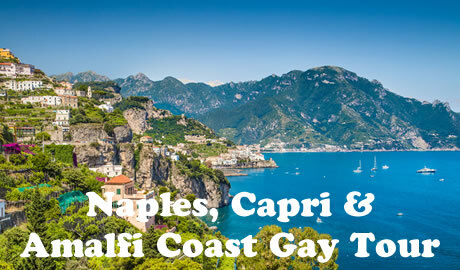 Join Italy Gay Travels on an amazing gay group tour of the coast around Naples. 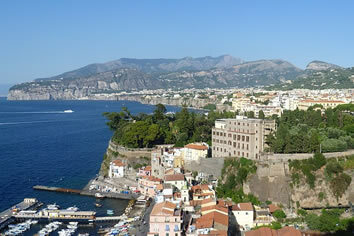 This unforgettable holiday will commence in Sorrento, world-famous for its romantic atmosphere. From there we will make our way to the Amalfi Coast and to the island of Capri, re-known for its beaches and the stunning faraglioni. We will finish the trip in the charming city of Naples: we will discover this amazing seaside city and its well-known gay nighthlife. • Travel with special Italy Gay Travels hosts. Welcome to Sorrento! Upon arrival at the hotel, you will receive your Italy Gay Travels welcome pack. In the evening join your fellow Gay Travelers and your tour hosts, Sergio and Kendall, for a Complimentary Welcome Dinner. During the night, we will all get to meet each other and have a full briefing on the adventure that lies ahead. After breakfast we will make our way to the Port. 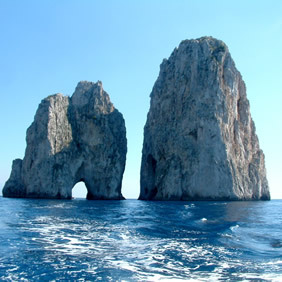 Stepping on-board a Hydrofoil we will reach the island of Capri, the first stop of our Gay Amalfi Coast Tour, in style. Capri has long been a hotspot for European gay life from the early 20th century. We will join a guided boat excursion around the island: we will have the opportunity to have a dip off the boat and splash in the crystalline waters of the bay. After the boat ride (around 3 hours) you will have free time to enjoy lunch and a stroll around Capri: around its famous Piazzetta you will discover fashion streets and glamourous boutiques. In the morning, we will enjoy a private transfer to Positano. We will have a stroll downtown, through its little pictoresque alleys, down to the beach. 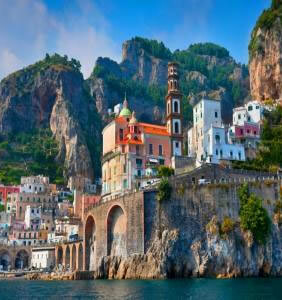 After lunch, we will step on an hydrofoil and admire the Amalfi coastline from the sea, while reaching Amalfi. In the afternoon we will visit this coast town popular for its scenic beauty. Free time in the afternoon to enjoy some shopping… or maybe laying down at the beach? In the evening a private transfer will drive us back to Sorrento. Overnight in Sorrento. Today is a free day: spend the time as you wish and explore the area at your own pace. Your Italy Gay Travels hosts will be around to offer advice and guidance as needed. After breakfast, it is time to pack. With a private transfer we will make our way to Naples. During the afternoon we will enjoy a private visit to Naples city center and its special atmosphere. In the evening join us for Complimentary Welcome Pizza Dinner. Pizza has been granted UNESCO world heritage status: we will make sure you taste one of the best pizza in the world! Today, after breakfast, our private tour guide will lead us through Via Toledo to Piazza Plebiscito and Castel dell’Ovo, a seaside castle whose name derives from a legend about the Roman poet Virgil and the oldest standing fortification in Naples. From here you can enjoy the beautiful sea view and admire Mount Vesuvius. 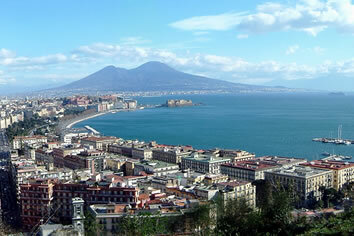 After breakfast the Gay Naples Tour group will meet to join a guided tour of Naples. We will visit famous landmarks of the Old Town of Naples, such as the Spaccanapoli and the Spanish Quarters. The area is rich both in popular culture (San Gregorio Armeno and its street art being the symbol of the area) and historical landmarks, including many noteworthy churches. Free time in the afternoon to enjoy the famous Piazza Bellini, a bustling Piazza in the center of the city where you will find a multitude of gay friendly restaurants, cafes, and bars. In the evening enjoy a complimentary typical dinner in Spaccanapoli: we will make sure you have a taste of the best South-Italian food around for our Farewell night. After dinner we will enjoy a drink or two around Piazza Bellini, the heart of the Gay night life of this city. Fly in/out to Naples (NAP). To get to Sorrento, you can take the public shuttle from Naples Airport. Farewell Dinner in Naples (Day 7) included.